The island is an unorganized, unincorporated territory of the United States, administered by the U.S. Department of the Interior. Most of the island’s scant population (approx. 150 in total) is made up of civilian contractors from Hawaii, California, Alaska, and Thailand. There is no local population and only a handful of Air Force personnel, most of which are MDA workers (Missile Defence Agency). Access to the island is highly restricted, and all activities on the island are managed by the United States Air Force. 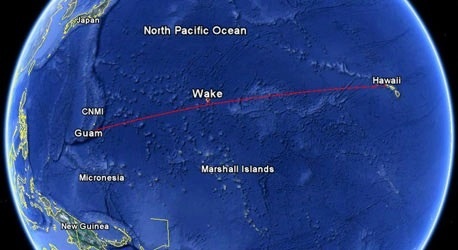 Commercial air service to Wake has been discontinued, and the atoll is no longer generally open to visitors. The airstrip remains available only as an emergency landing site for trans-Pacific flights; if you don’t have official business there, a visit is nearly impossible. I was working as a conservation intern for a fine arts conservation laboratory based in Oberlin, Ohio. 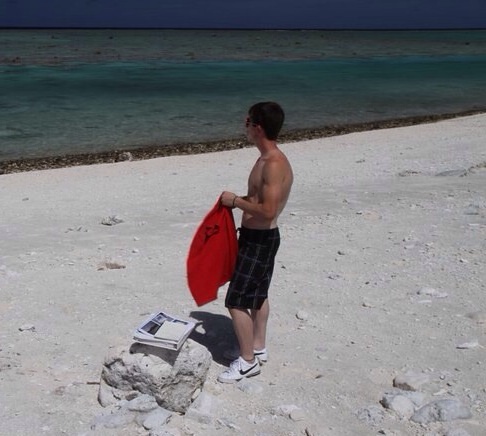 My supervisor and I were contracted by the US Government to survey and assess Wake Atoll for historic landmarks and artifacts, and to train personnel on how to conserve them. 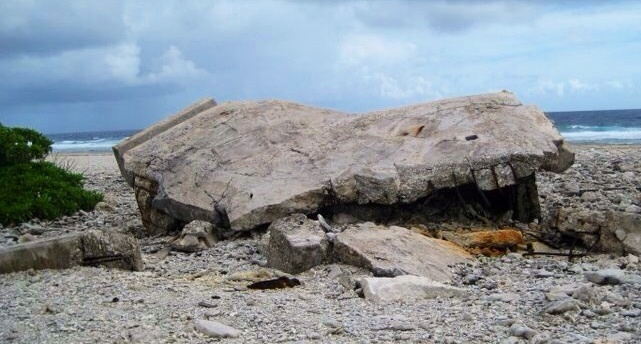 Our directive allowed us two weeks to identify all historically significant sites on the three islands, and to create a treatment protocol for the quickly dilapidating artifacts and structures. With my background as an archaeologist, I quickly realized why I was brought on board. While my boss, a seasoned art conservator, managed the treatment report, I was in charge of the hefty survey and artifact analysis. We departed Cleveland, Ohio towards the end of September, happy to be leaving behind the encroaching cold for tropical climates. Booked on separate flights to Honolulu (my boss’s idea: in case one of our planes were to crash in some fiery spectacle, one of us would still make it), I enjoyed a micro-brew with my airport meal at LAX as I awaited my connecting flight. 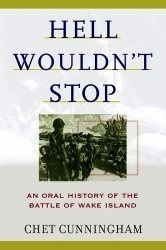 I sat reading from ‘Hell Wouldn’t Stop: An Oral History of the Battle of Wake Island’ and thought of the horrors that those men witnessed, both during and after the historic battle. This book, a journal, and the clothes on my back were all I had. My large duffle bag, carrying all of my clothes, toiletries, and work equipment had been checked in CLE and would await me in Hawaii. You can imagine my surprise upon arriving at HNL when I was informed that my luggage remained in Los Angeles! 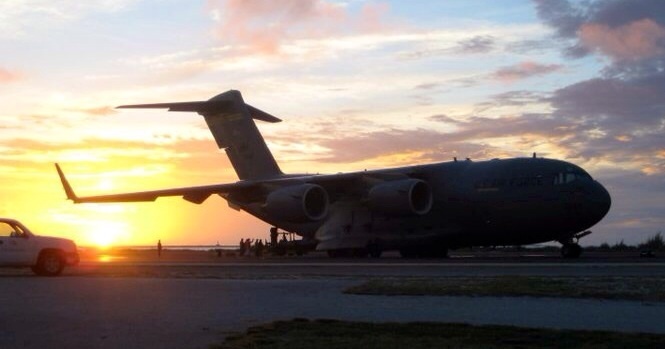 With only three hours before our military flight from Hickam Air Force Base to Wake–a flight that only departs every two weeks–I had virtually nothing to see me through my adventure. I was perhaps most frustrated by the loss of my scuba equipment, as the waters around Wake are full of amazing reefs and sunken ships. So, with the airline’s sincerest apologies and a voucher for $500, I hailed a taxi to the nearest Walmart, where I purchased some basics for my time on the island. The flight to Wake was long and uneventful. It was my first time aboard a military cargo plane (Boeing C17), and I was excited by the change of setting. The other passengers and crew consisted of U.S. Air Force personnel who had been on R&R (rest & relaxation) and were returning to their posts, and a few dainty Thai stewardesses with bright smiles. 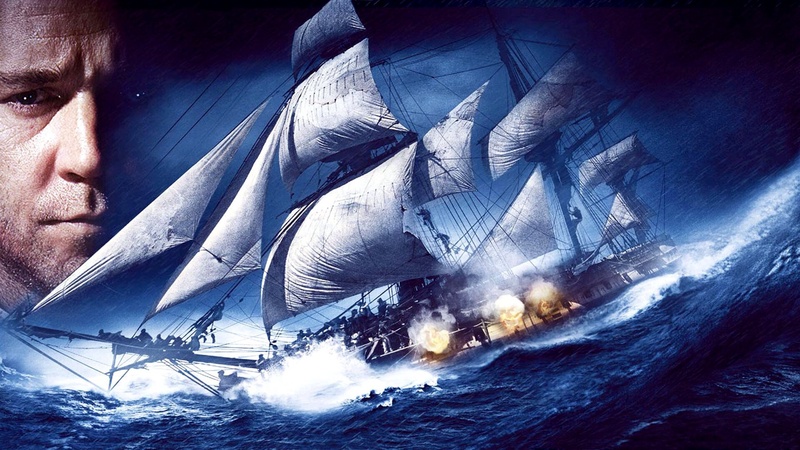 I enjoyed the in-flight movie, “Master and Commander” (the ultimate Dad-movie starring a stoic Russell Crowe), for the first 2 hours and 18 minutes, although it was less enjoyable when it was shown for a second and third time. We flew through the night and were chased by the sunrise as we crossed the international dateline, effectively leaping one full day into the future, and arrived over Wake Atoll as the suns rays danced across the breaking surf. The pilot performed a sweeping arch around the mouth of the lagoon before banking left and plunging towards the runway–a silent dive-bomber with its target in sight. As the earth loomed closer, the wind socks were in full furl, indicating a southerly gale. The aircraft pitched suddenly, only to correct itself and make contact with the tarmac. My grip on the armrest slackened and I let loose a sigh of relief. We had arrived on Wake. After formal introductions with the Island Commander, my supervisor and I were assigned a vehicle and shown our accommodation on an island map. We would be staying in the officer’s barracks on the north side of the main island. As we left the commander’s office with a satchel of required permits, a handheld radio, SATphone, and our luggage in tow, I searched the parking lot for the armored HUMVEE we were sure to be driving. To my disappointment, all I found was a standard white pickup truck, rusting away from the sea air and in serious need of its own conservation. Loading up–and slowly letting go of my dream of being Rambo–I drove towards the barracks and got straight to work. 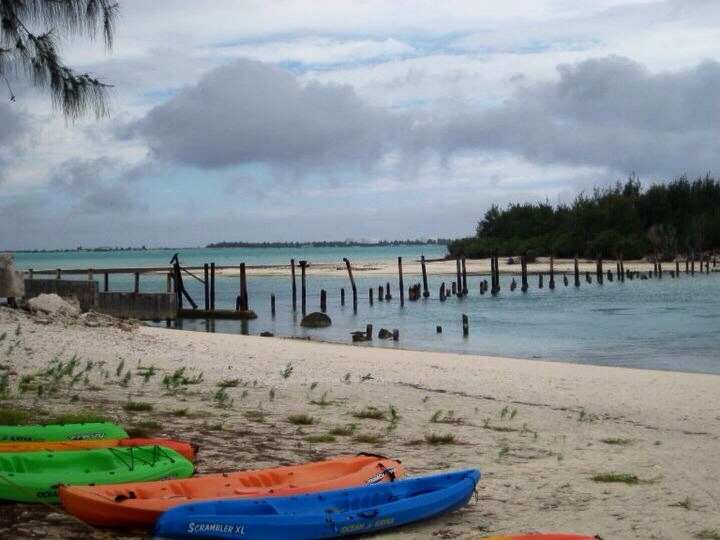 I spent the following weeks completing the GIS survey and assessment of the three islands among the atoll. The weather was beautiful but the sun was blistering. After spending 12 hours surveying in shorts on the second day, observed by the equatorial Sol, I realized too late that I had forgotten to apply sunblock to my legs. This mistake resulted in the worst sunburn of my life, one which left my legs blackened and swollen three sizes. Work continued, unpleasantly, in jeans. 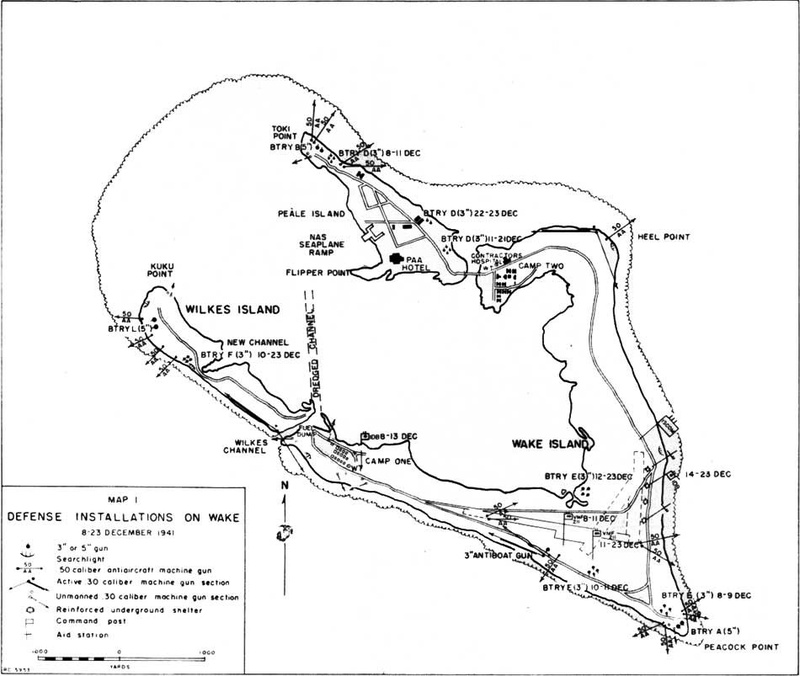 Through my survey, I identified several locations on Peale Island that required in-depth test excavations, as this was the island most occupied by the Japanese, and where the locals had collected the most artifacts. Excavations revealed a Japanese kitchen with brick ovens and eating utensils among broken wine and beer bottles from the war era. At the time of my visit there were over 300 MIA/KIA on the island. The discovery of human remains was more probable with each stroke of the trowel. My time was spent in a flurry of excitement and exhaustion with 12 hours each day dedicated to surveying, excavating, making assessments, and doing write ups. Each morning began at 5:00am with an 8-10 mile run. Breakfast was in the mess hall at 6:00am and work would commence at 6:30am, which, on many days, included a kayak trip to Peale Island with sharks circling underneath (the bridge to Peale had burned a few years before). The bridge to Peale Island had burned a few years before my arrival. 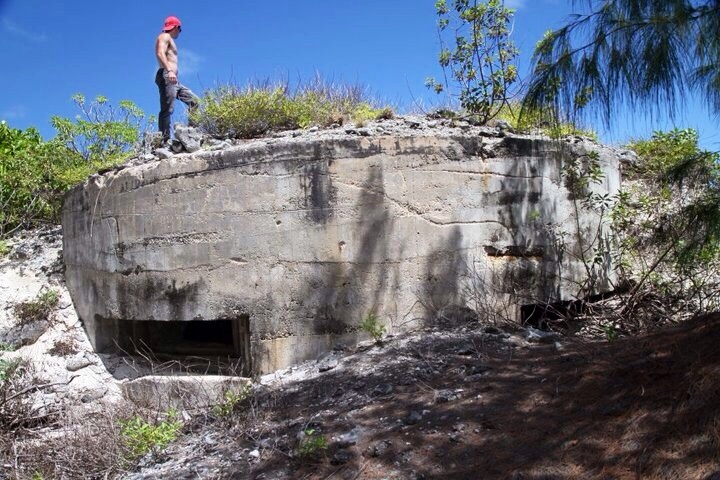 I was responsible for the final report on Wake’s historical landmarks, which included pillboxes, gun emplacements, bunkers, rifle pits, and other structures. While some of the remnants appeared to be structurally sound, most were undergoing increasing amounts of corrosion. 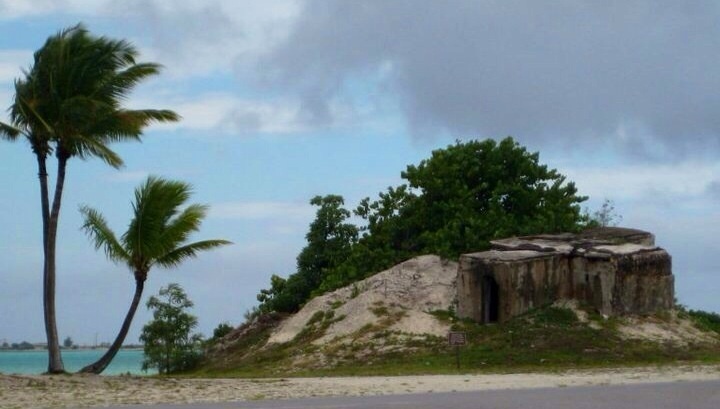 The matrix for the concrete pillboxes and bunkers contained high levels of chlorides since sea water was utilized in their construction. The defenses were built for the time at hand, and not to last. The rebar in these monuments had been undergoing corrosive processes for nearly 70 years, causing large sections of concrete to spall. Our treatment included application of a new product that would remove all chlorides from the structures and shield them from future corrosion. 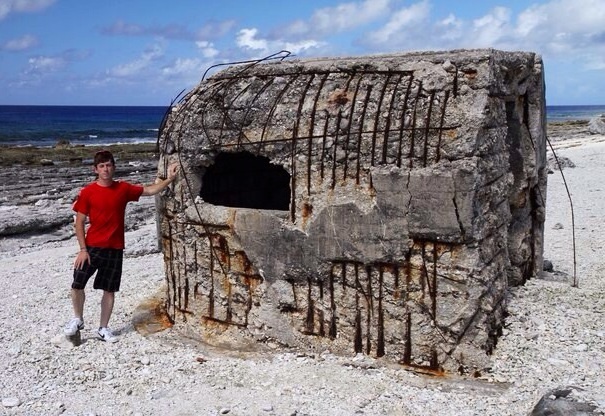 We used a similar application on the 3″ and 5″ gun emplacements that were mounted around the atoll. 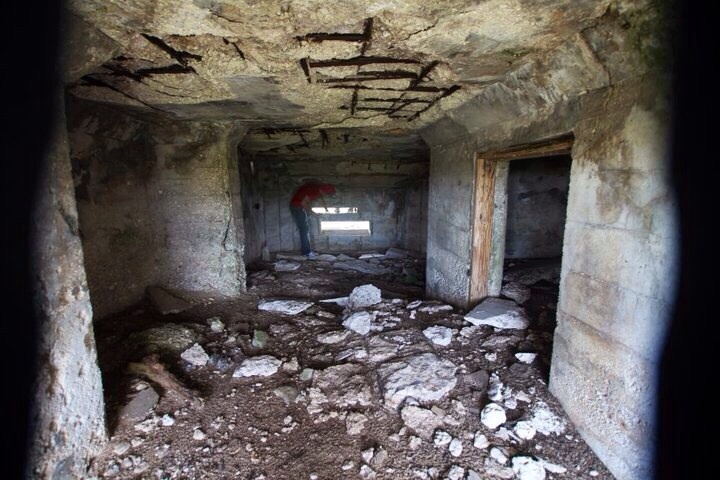 The WWII structures were in varying stages of dilapidation. After the workday was through, I would relax with a few pints at the local (only) bar, Drifters Reef. A pint of domestic brew was $1.00, wholesale prices courtesy of the US government. It was during these times that my presence would garner the most attention from the locals. I was the youngest person on island by 20 years and everyone knew that I was in charge of the archaeology, collecting the items they too had sought in their free time. Many of these men asked about my discoveries, always interested in any WWII ‘memorabilia’ such as rifles or knives (which were abundant). Others urged me to look out for the UXO’s (unexploded ordinances) that dotted the landscape. Several of these hazards would be collected by the bomb squads and detonated in safe locations during my stay. During one conversation, the bartender divulged an interesting oral history account left by an American POW who had fought in the initial battle. The account stated that on Dec 19th (4 days before his surrender), the marine was given orders to destroy tens of thousands of American banknotes to keep from the Japanese in case the island was overrun. Thinking ahead, and not one to squander an opportunity, the soldier decided to bury the notes in watertight ammo cases, leaving a description of the treasure’s location on the southern beach near his gun emplacement with his family upon returning home. The marine lived through his imprisonment in Asia but never returned to Wake and has since passed away. I followed up on the bartender’s story, but without proper detection equipment, a search for the canisters proved futile. I suspect that if the marine’s story were true, the money should remain there to this day. At the end of the two weeks on Wake, we had successfully completed the survey and assessments, adding many previously unknown sites to the historic registrar. But we had barely scratched the surface. The island is a battlefield archaeologist’s dream, with artifacts littering the jungle landscape. Our treatment plan for the monuments was shown to the local custodians and there was instruction given on how to convert an old church into a climate controlled museum facility for the thousands of artifacts that were both discovered and already in possession. Unfortunately, the last I heard, not a single treatment had been undertaken and the monuments of that historic episode are on the verge of being lost forever. So, my time in the Pacific had come to a close. I boarded the next C17 en route to Hawaii and took my seat. I smiled to myself as the stewardess prepared the in-flight movie…Master and Commander. Assessing the mechanics of an 8 inch gun. 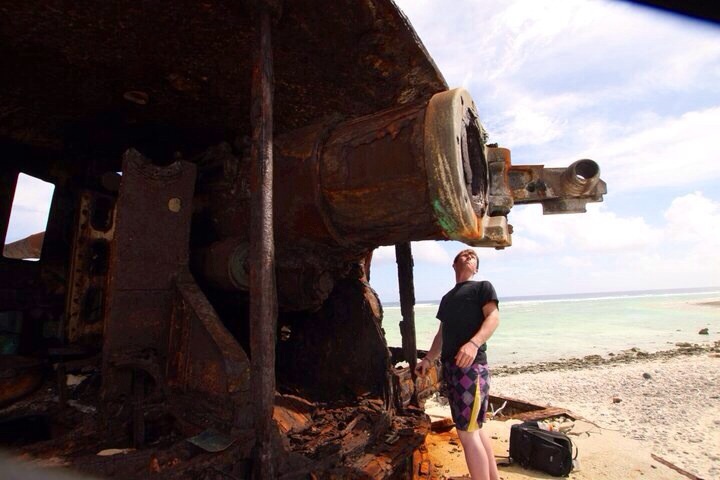 This huge weapon was taken from a warship. 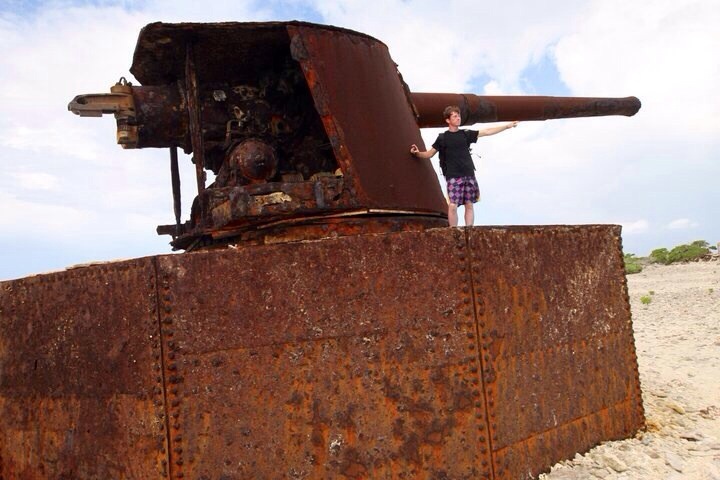 8 inch gun positioned to guard the sea. The machine was heavily corroded by years of exposure to sea air.